A longer temporal string of comparable data (from 1961 to 2007) indicates the decreasing run-off of river water in Slovenia. The National Environmental Action Programme indicates the abundance of water as one of the greatest comparative advantages of Slovenia and as a decisive factor for sustainable development which requires optimum management. The Water Framework Directive 2000/60/EC also sets as one of its objectives the promotion of such use of water that in the long term will protect available water resources, and indirectly also as harmonious a river balance as possible. Due to a rather high annual variability of river discharges, a longer temporal data frame is appropriate for trend assessment. According to the operating of the observed water gauging stations, we find as the most appropriate the frame which begins with the year 1961 and ends with 2000. 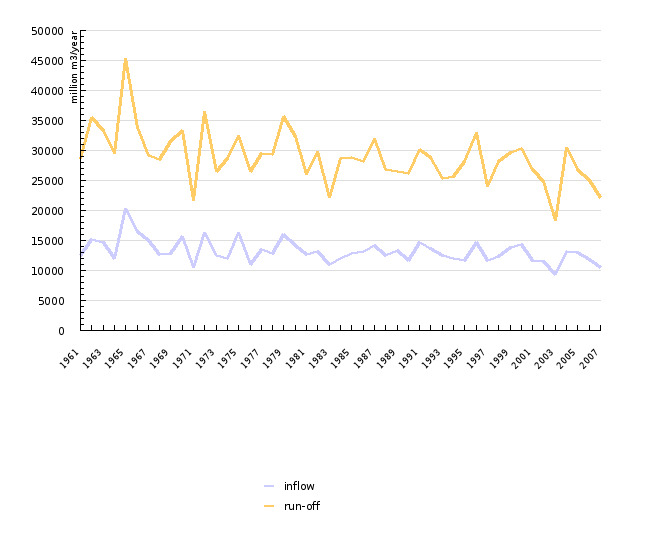 When taking account of the entire frame of data (1961-2007) or a thirty-year period (1971-2000), the decreasing trend in river run-off is rather obvious, however, if we take account only of the period from 1981 to 2000, the trend is barely detectable. Indirectly, the annual river run-off trends also recall the increase or decrease in the probability of low water (droughts) and flood hazard occurrences. However, the annual river run-off trends do not always correspond to trends of high or low water. The data are taken from the Hydrological Databank maintained by Environmental Agency of the Republic of Slovenia. The methodology for monitoring, control and processing of hourly and daily gauge heights, hydrometric measurements, conversions of gauge heights into flow rates, longitudinal equalizations and harmonisations is standard. The mean annual flow rates are calculated from mean daily flow rates. It is considered that the original data may deviate from actual values by ±5 %. The data on mean annual flow rates (Qs) of the water measuring stations derive from the measurements and observations in the measuring network of the state water monitoring (the data for the hydroelectric power stations Dravograd and Formin, Dravske elektrarne Maribor, was also taken into consideration). The year 2007 is the last year for which we hold official (verified) data on the flow rates of the water measuring stations. Since national borders do not coincide with the watersheds determining the borders of water catchment basins of water measuring stations, the river inflow and run-off expressed with the flow rates of selected water measuring stations and the actual inflow and run-off are not consistent. The level of consistency is different for different catchment areas. The data on the flow rate of the Mura River are harmonized with the Austrian Hydrological Service. Such harmonization does not exist for other water measuring stations which represent balance profiles for inflow/run-off into/from Slovenia.